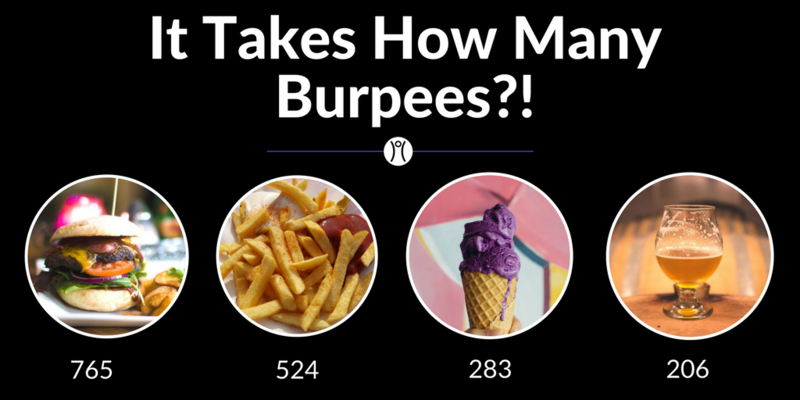 You’ve probably seen a number of images circulating around social media, “helpfully” letting you know just how many burpees you need to do to burn off a candy bar, or a typical holiday plateful of food. Every time a similar image comes into my feed, the same general thought goes through my mind, “Who cares?” – Followed by a wave of mild anger. #1 – It creates a really negative headspace surrounding something that should be positive. Exercise releases all sort of feel-good chemicals into our bloodstream. If you spend every minute hating your workout, that chemical release simply won’t happen. #2 – One special meal or occasion will not make a lasting difference in our health or appearance. It’s what we do the other 90% of the times that DOES make a difference – consistently making healthy choices surrounding both food and exercise. So I’m here to tell you: You don’t have to earn your food, and exercise is not a punishment for what you have, or are about to, eat. Viewing exercise as punishment for what we eat is just the flip side of the Licensing Effect coin (I CAN eat a giant meal because I just got a killer workout), another unhealthy perspective. A chosen exercise isn’t better simply because you hate it more. Just like we’ll drastically improve our chances of eating in a healthy, balanced fashion by never dieting again (choosing to make small, lasting changes instead), you’ll be significantly more likely to continue exercising, and exercise more often, when you discover what kind of exercise you love to do and why. Just because all of your co-workers have started running on their lunch breaks, if you despise running, I wouldn’t suggest you join them regularly (though I’d certainly encourage you to try it once or twice just to be sure). Start a lunch-time walking, dance, or yoga group instead, if that’s the type of movement you enjoy. Ask yourself why you’re working out, and if your reasons are less than positive, consider making a goal to purposefully choose a different reason the next time you get out and move, however that might be.